Freeman's Mind - "Kept you waiting, huh?" 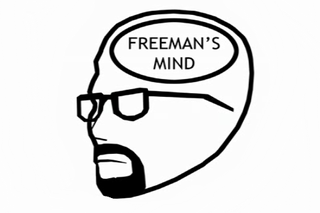 So yeah; Basically, Freeman's Mind is a voiced playthough of the first Half-Life game. The catch is that the voice you're hearing is actually Gordon's inner thoughts while the events of the game transpire. You'll be quick to find, however, that this guy isn't as stoic as the games would have you believe.. (sometimes I wonder if the description "neurotic" is really enough) As for my opinion of it; While I don't know all the stuff he may or may not be missing due to having never played Half-Life before, and the language is kinda saltier then I prefer, I've enjoyed watching this series quite a bit. Seriousness takes a backseat here, and don't expect to see -er, hear any long pauses, as the gameplay itself isn't necessarily the main attraction. If you want to start watching the series, Episodes 1-44 can be found on this Machinima showlist, and the rest will be on this other channel. From what I know, new episodes are aimed to come out every two weeks. Here, I'll even embed the first one for you! If you want to learn more about this series, its creator Ross Scott, his other work, or anything like that, head on to AccursedFarms.com to do such things. Now, if you'll excuse me, I need to get a Faraday Cage helmet, since tinfoil hats apparently do jack-squat..